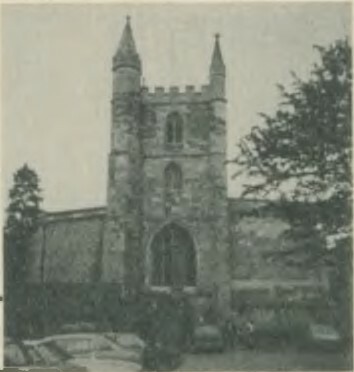 St. Michael’s Church, Basingstoke, where the Guild Service was held. The AGM was held this year in the Trinity Hall, Basingstoke, on Saturday, July 7th. The meeting was attended, even at its outset, by some 100 members, which number gradually grew during the course of the meeting. It was encouraging to see the AGM, largely a purely business affair, supported so well, since this particular centenary event, by its very nature, lacked the grandeur of the service held in Winchester Cathedral or the drama of the striking competition. 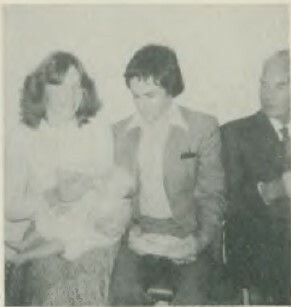 The meeting was honoured by the attendance of an ex-member from as far away as Johannesburg, John Hopwood, and other visitors from the Midlands and East Anglia. These ringers the Master (Mr. Kenneth Croft) welcomed in his opening speech and also informed the gathering of the receipt of a letter of congratulation from the niece of Miss Alice White (now Mrs. Sullivan and living in Canada) who is nearly 99 years old, the first lady ringer to ring a tower bell peal. This was indeed a reminder of the historic nature of the occasion. The immediate Past Master (Roger Savory) also sent congratulations from America, and added that he hoped to be back in England and “see us all in the Fall”. We hope that despite this Americanism he has not succumbed to total Americanization! After the minutes had been read, approved after minor correction and had failed to stimulate any discussion, the reports of the various Guild officers were presented. These were printed in the annual report, copies of which the assiduous had remembered to bring but the dilatory had forgotten. These, too, the meeting found satisfactory, and even the report of the Treasurer (Mr. John Colliss) which, by its monetary nature might have rendered it susceptible to closer inspection by members, was deemed to be error-free and in need of no explanation. The Master thanked all the officers for, in his words, “work well done”. The Trustees of the Bell Restoration Fund, in view of the requests for grants they had received and the healthy state of the fund, now standing at approximately £4,500, this year recommended the distribution of £1,000 amongst five towers. One tower, Ropley, was to be granted £150. but it appeared after some discussion that all the necessary money had been raised by local effort. Several members voiced concern that, in this case, we could not be assured that the grant from the BRF would go specifically to bell restoration as the rules of the fund demanded. In view of this, Ropley’s splendid local effort was praised and the grant that would have gone to that destination was distributed amongst the other towers whose need was more urgent. 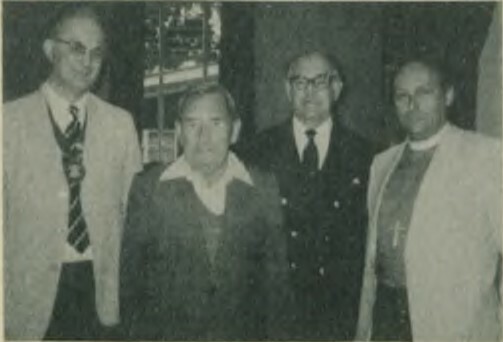 The Master (Ken Croft) with two newly-elected life members (Lester Bailey and Fred Green) and the Bishop of Basingstoke (Rt. Rev. Michael Manktallow). Another matter of interest which arose from the discussion over grants, always a lively topic, was the matter of self-help on the part of the various towers. It appears that the Trustees take this matter into account to a certain amount when recommending grants. One member objected to any grant being given to one particular tower since it had not produced any money itself. This extreme view was strongly countered since the band in the tower in question was only just getting started, and the applause this riposte engendered showed the meeting’s rejection of any rigorist self-help policy. Under “Any Other Business” Mr. Fred Collins raised the matter of elections. He would like to see, he said, a state of affairs where the membership had at least three months notice of the various officers’ intentions as to whether they were or were not willing to stand for re-election prior to the triennial elections. This would avoid the possible embarrassment of a meeting being unable to decide on, say, a new master if he (or she) unexpectedly decided not to stand. Mr. Graham Nabb replied to this, stating that when members came to such a meeting they should be aware of their responsibility of either re-electing officers or electing new ones. Mr. Collins’ proposal would detract from the responsibility which was ideally vested in the meeting as a whole. Mrs. Jessie Kippin (Chairman, Winchester District) stated that this was what she reminded her members until she was “blue in the face”, she said. The Master also strongly stated that officers were appointed to serve for three years and three years only, implying that no officer, or the meeting, had the right to assume his or her being re-elected: it was all up to the meeting at the time. The meeting we had this year, if not outstandingly well attended, did seem to take the business seriously, with many members speaking on a variety of issues some of which have been described above. The Master chaired the meeting well, allowing, and indeed, positively encouraging discussion on all topics, even Superlative Minor S. Major. It is for this, namely the voicing of opinion on any relevant subject, that meetings are called, even if the result is a long agenda and a lengthy meeting. (This meeting had 19 points on the agenda and lasted some two and a quarter hours). This, however, is the sign of a Guild’s vitality. 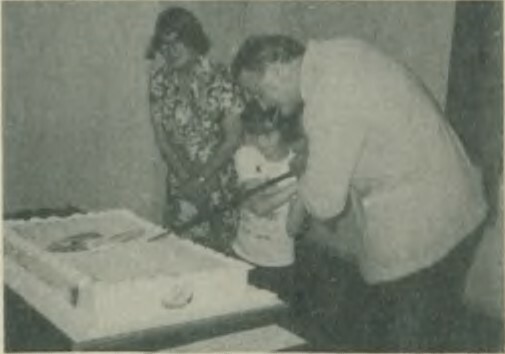 The Master and Julia Cater (8) cutting the Centenary Cake with a naval sword, whilst Mrs. Jessie Kippin (who organised the tea) looks on (anxiously?). When all had received their statutory piece of cake, the ringers dispersed, some to the various towers and others, the organizers, to do the washing up. The cake, however, was not by any means finished off, and I suspect it may well find its way to more than one subsequent ringers’ gathering. You can’t get away from this Centenary business! Feeding time.- Baby Elizabeth Nabb was not to be left out during the tea break on the day of the W & P Centenary A.G.M. Mother (Philippa) is Guild Librarian, and father (Graham) was responsible for the recent special production of the Ringing World articles containing the Guild’s history. An interested spectator looks on.